Spend 9 days discovering why New Zealand’s South Island is known as one of the most pristine places on Earth with visits to Queenstown, Franz Josef & more. Spend nine magical days discovering why New Zealand’s spectacular South Island is known as one of the most pristine places on Earth. From wild sweeping landscapes to fine wine and charming hospitality, this part of the world is a joy to explore. Christchurch will amaze and inspire, Aoraki Mount Cook World Heritage Park is simply breathtaking and you’ll delight in Dunedin’s Scottish heritage. There are no words to describe the wonder you’ll feel when you first set eyes upon the mighty Franz Josef Glacier and you’ll find that the TranzAlpine is the trip of a lifetime. Experience the spectacular Fiordland National Park where towering cliffs and crystal waterfalls will leave you awestruck before exploring Queenstown. Kia Ora and welcome to Christchurch for a two night stay. The wonder of New Zealand begins here, celebrate the start of your journey with a welcome dinner. Go punting on the River Avon, take the Botanic Gardens Tour or see Christchurch from an open top bus. Alternatively, visit the seaside town of Akaroa or the International Antarctic Centre – the choice is yours. Join the TranzAlpine this morning for your rail journey across the Southern Alps. Visit the home of New Zealand’s native greenstone, Hokitika. Stand in wonder at Franz Josef Glacier with its ever-changing face before your overnight Special Stay. Optional flight - Take a helicopter flight over Franz Josef or Fox Glacier and experience the wonder of a landing in this natural alpine landscape. (Additional expense). Wilderness and adventure beckon on the Dart River or enjoy a guided tour of local wineries. Alternatively, feel exhilarated on the Shotover Jet or take a 4WD Safari on the Scenes tour exploring The Lord of the Rings filming locations. A guided tour through Skippers Canyon is also available for you to enjoy or a guided walk around the lake edge. Take a steamship cruise on TSS Earnslaw and enjoy dinner at Walter Peak, ride the Skyline Gondola and dine overlooking Queenstown or enjoy dinner at your hotel. Travel to Fiordland National Park to witness the spectacular beauty of Milford Sound. Be in awe of the towering cliffs, peaks and waterfalls. Experience a special screening of Ata Whenua – Shadowland. Also known as Fiordland on film, this short movie takes you on an unforgettable journey over the world heritage wilderness. Your base for tonight is Te Anau. 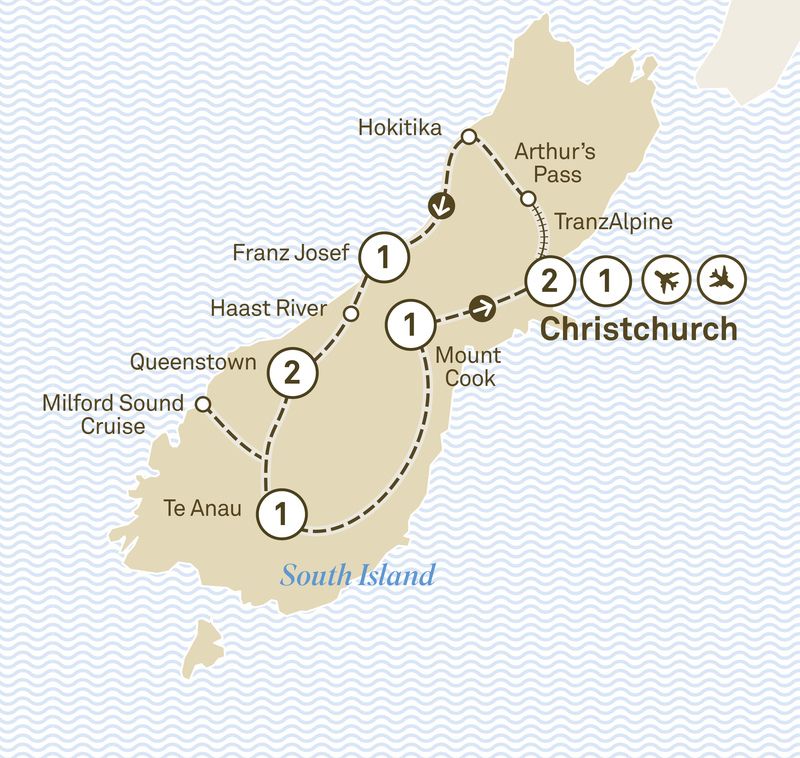 Optional flight - Take a scenic flight from Queenstown to Milford Sound instead of travelling by road. (Additional expense). See the fertile, sheep filled farming land of Central Otago en route before soaking up the alpine landscape of Aoraki Mount Cook National Park. Enjoy a Special Stay . Visit the Church of the Good Shepherd on the shores of Lake Tekapo. Travel through the patchwork countryside of the Canterbury Plains before arriving back in Christchurch for an overnight stay. It’s time to bid a fond farewell to your new friends and the wonders of New Zealand. From the South to the North, experience the spectacular wonders of New Zealand with highlights such as the Franz Josef Glacier, Queenstown & Auckland.